More than plant machinery, the Combo wet processing system is a technological response to the challenges faced by materials producers and is tipped to reshape the wet processing industry's landscape, according to Northern Ireland-based CDE Global. 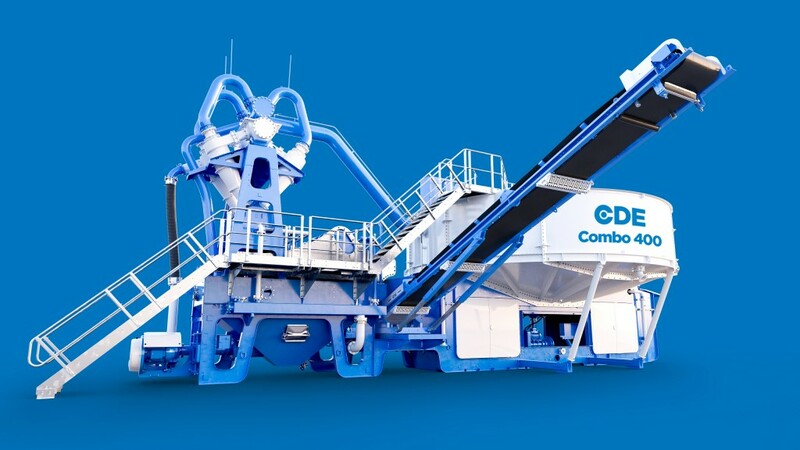 Engineered as a turnkey solution that delivers in-spec washed products from a wide range of feed materials, the Combo can be used in the construction, C&D waste recycling, industrial sands, mining and environmental sectors. It has been designed with a focus on transferring greater reliability and efficiency benefits to customers. With all essential processes being housed onto one chassis, the Combo system operates as one interconnected and pre-assembled unit, which incorporates an integrated control panel with one single point of operation. These machines are an ultra-compact washing solution that requires minimal civils and pipework, and operators can now easily relocate their plant across sites or to remote locations. Kevin Vallelly, Director of Engineering at CDE, said: "Our new Combo™ is the world's first wet processing system with integrated water treatment. For the customer, its bespoke, pre-determined design reduces the overall footprint on site compared traditional processes. Pre-wired and pre-tested before dispatch, the plant is built for rapid assembly and set up, and can start processing material within days of arriving at the site." Vallelly continued: "Throughout the design process, our engineers focused on access for maintenance and on optimising the lifespan of the plant. The Combo™ provides safe and superior access to all areas, and in line with our ‘Do it safe' ethos, complies with all relevant ISO standards. The robust design is complete with premium wear liners, which will remain operational and efficient for over 20 years. This represents a significant return on investment for our customers." Described as a "pre-determined" solution to boost plant utilisation, one of the many benefits of the Combo™ wet processing system is its customer-focused design and unmatched accessibility features for maintenance. Materials processing is a harsh working environment, which is why the new Combo washing system features components in areas of high-wear to minimise the mechanical fatigue cycle of the plant. One common area of fatigue, a result of weld stress over time, is on primary screens which traditionally use welded connections. These screens have been succeeded by the patented Infinity Screen™, resulting in greater durability and prolonging the operational life of the plant. To maximise output for the customer and the commercial value of their aggregate, CDE's ‘transfer point technology' - the material transfer points between different stations - has been utilised to eliminate high operational wear zones. CDE Global will be exhibiting at outdoor exhibition area North/East - Stand FN 1022/1 at bauma 2019, from April 8 - 14. A press preview revealing the Combo will take place at the CDE exhibition stand on Monday 8th April at 4pm. Visitors to Bauma can also learn more about the Combo during a focussed Masterclass taking place on the stand on Tuesday 9th April.